Telenor Connexion signs contact with Kamstrup to provide a Managed Connectivity solution for their smart metering project with DONG Energy, which will be the largest rollout in Denmark so far. OnStream's gas and electricity meters become even “smarter” thanks to a wireless solution from Telenor Connexion. OnStream’s innovative and wirelessly connected smart meters enable consumers to have more control over their energy consumption and supports the benefits of smart grids. 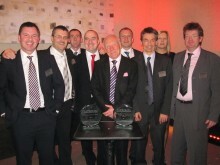 The ”European Smart Metering Awards 2011” recognise excellence in smart metering and acknowledge companies playing a defining role in moving the industry forward. Telenor Connexion customer OnStream won both “Metering Manufacturer & Technology of the Year Award” and “Innovation of the Year Award” for their connected Smart Meters.